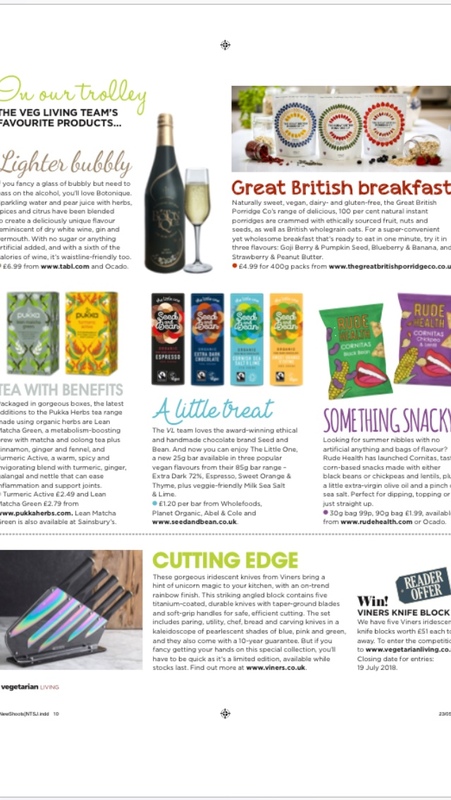 6 months on from when we first launched The Great British Porridge Co not only are we rapidly becoming the nations favourite healthy porridge choice, we've been popping up in some amazing magazines. Its been so incredible to see us featured in the likes of Vegetarian Living, Womens Health, The stylist, Female First and The Speciality Food Magazine. Who could ever imagined that this 100% natural instant porridge that I started making for my family in a bid to get them to eat porridge would be featured in such great titles. What is so good that our porridge is appealing to some many people, vegans, non vegans, people on a gluten free diet, people who just want to eat natural good quality food, people in a rush. We are being hailed as one of the healthiest, quickest breakfasts around. Staggeringly over half of Britons don't eat breakfast because they don't have time for it. Lack of time is when we make unhealthy food choices so here at the Great British Porridge Co we have certainly solved that problem and its brilliant that we are being recognised for it. Pick up one of these wonderful mags next time you see one, lovely to read whilst you eating your porridge.